“Clothing is ultimately the suit of armor in which we battle the world” By Sophia Amoruso. What could be a better attitude to start your year with than being a Girlboss? That’s right ladies! Get yourself together and leave all the bad things that happened last year behind and focus on the right way to make 2017 your best year! This year I want to focus on my career, I want to be the best at it, inspire and meet new people around the world and find my way to success. A few days ago I was reading one of my favourite magazines “In style’’ that featured Nicole Scherzinger and what I liked the most about her interview was that she is a really hard working woman, very busy but also successful. So, let’s focus a little bit on our place of work to begin with. In my opinion, it is important that at work you make people respect you for your talents but we can’t neglect that how you present yourself in front of others is extremely important. Together with your attitude the clothes you are wearing, impact the way people hear your opinions. It can determine whether others listen, trust you or ignore you. As a woman, is not always easy to dress presentable since that can mean wearing heels almost everyday which is not so pleasant. We don’t all work in places like Rachel Zoe ( from ‘’Suits’’ if you have seen the show, maybe Prince Harry’s girlfriend rings a bell?) but all we need is a few statement items that every woman should own in her wardrobe. Before I present you all these keep in mind that this is the Sale period which means that everything here is on SALE. 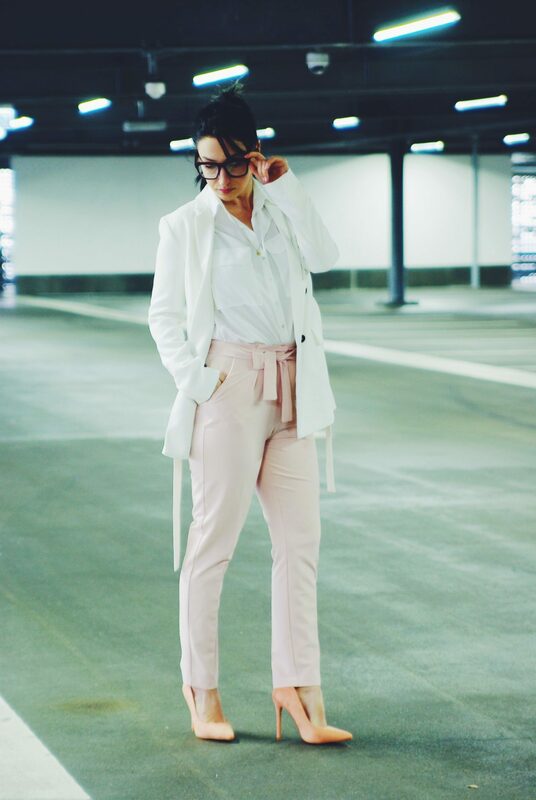 I like to start with the classic white shirt HERE , buy it from women department or even from men’s department ( mine is from the men’s department) you can always use it for work, interviews, meetings and so on. A pair of black tailored pants is another item that should not be missed. The great thing about black pants is that you can match them with many other blouses or shirts depends on the occasion. A well cut blazer is a great layering piece that makes an outfit look more polished. Sure, it looks good with the black office pants but you can also style it with any type of jeans, skirts and shorts. While shopping for a blazer, choose a simple classic one or one that’s got a little something special on it. A pair of black high heels may sounds inconvenient for some of you but it doesn’t have to be. My high heels are way too high to stay and work for 8 hours in them, I admit that. But you can also pick a pair of high heels with less than a 5 inch heel so they feel less intense. There are bags that we love and the bags that we actually use and then there are those that can be both. While you want a bag that is beautiful you also want it to be practical. I recommend a bag that does not weigh to much when empty and made from quality leather tends, it’s sturdy and maintainable. I have owned my Givenchy bag for about a year and because of it’s size I can fit my laptop in it together with lunch and some essentials. Over time it got a stain or 2 but they were easily removed. At the moment I am looking for another bag like it but am still not sure what to pick. My thoughts go with Celine, but I will have to research more on that. The statement watch is a piece that makes a difference to your outfit. Find more about that in my previous article The watch that makes a statement. Going to work I didn’t use to wear a lot of make up, first of all because I did not had much time for it in the morning but also because after working 8 hours it can get sticky and quite messy. So I like to keep it simple with only foundation, blush, eyeliner but nevertheless, RED lipstick HERE. With this being said I hope you found my article useful, that it helps you dress presentable for work and what better way to start your year than by shopping. When I was small my parents would make me believe that how you spend your first day that’s how your whole year would be. I don’t know why but I still believe in this superstition and since I am starting my year by shopping, that should mean that I will shop the whole year , right? Looking for more work wear inspiration? Check out Build your wardrobe category.